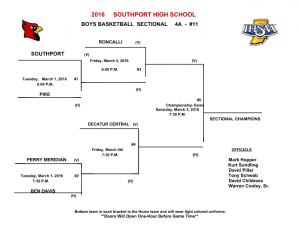 The Southport Sectional Parings were announced over the weekend. Both Southport and Perry Meridian will play on March 1st at the Southport Fieldhouse. The winners of the first two games will advance to play Roncalli and Decatur Central on Friday March 4th. Single game tickets can be purchased at the fieldhouse for $6 dollars or entire session tickets for $10 dollars.